I have a scope that mounts directly to my flattop reciever. I need to raise the level of the scope so that it is usable. I know you can use mounting rings, but how if it was ment to mount the the flattop reciever? are you asking about some risers for the mount? 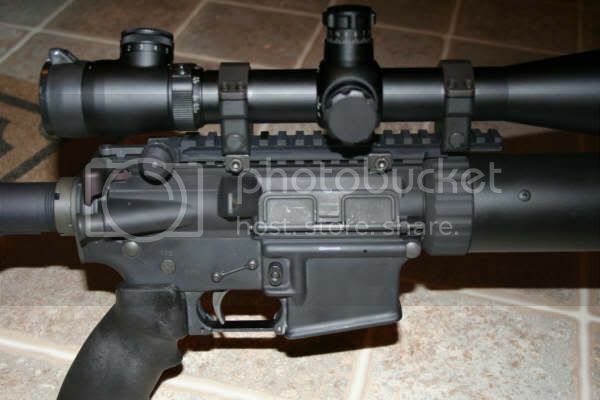 Dave where in the F is your rear sight? are you talking about you need something like this ?? there are alot of risers out there if this is what you need. and we are lucky to have them, for they the battle make. Are you talking about a scope with an integrated rail mount? If so you could try an ARMS 38 Swan Sleeve. I'm not real clear on what you mean. I agree if you are using a scope designed for rings, that you can use a set of tall rings to elevate it. How do you see through the front sight??? I can't. This gun did have a fixed upper carry handle. I wanted a flattop reciever. I turned the gun into more of a tactical gun. I can't. 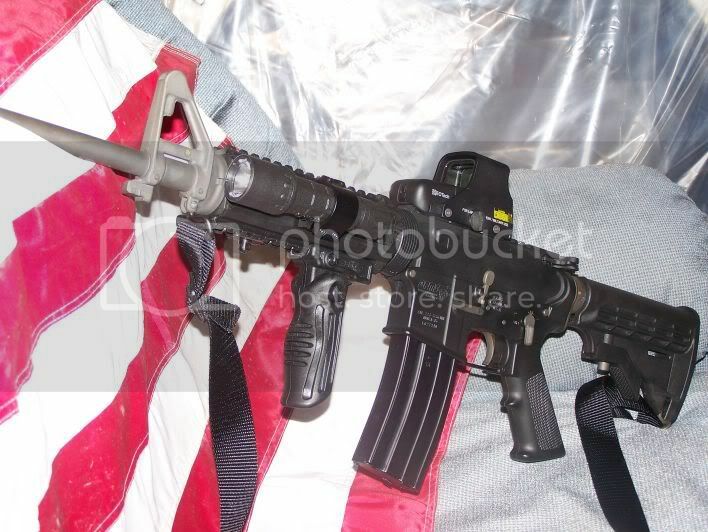 This gun was did have a fixed upper carry handle. I wanted a flattop reciever. I turned the gun into more of a tactical gun. You could get new rings, risers, or something like the swan sleeve. At high magnification the fsb is nothing but a smudge on the edge of the scope (if noticeable at all). With the pic you have provided you could just buy higher rings, or get a riser as was said. the scope has 2 bars that mount to the flattop. How would you mount this scope using the mounting rings? You would have change the rings with something like these. What do you mean by bars? Are these bars part of the scope or the rings? Looking at your first photo I don’t see any bars. You’re not referring to the rods in the scope rings that prevent forward / rearward movement, are you? there are two bars that are part of the scope. they sit on the flattop. then there is locking nuts that go on the screws. Those bars are part of the scope rings, not the scope itself. You can purchase higher scope rings and replace the ones you currently have. Just be sure of whether you have 1” or 30mm diameter scope. Or you could get risers (such as these). Or you could get something to raise the flat-top (like the Swan Sleeve). You're right! I just looked at the scope. The rings were already mounted to the scope. I think they are 1" high. I need to elevated it up to at least 2" or 3" to use the scope. Do they sell rings that are 2" or 3" high? Those rings are not 1” high (as measured from the base of the scope to the top of the flat-top. Scope rings are typically referred to as low, medium, and high. Looking at the picture, you have low rings. Just look for medium or high rings (be sure of whether you have a 1” or 30mm diameter tube) -- remember you don’t have to raise the scope above the front sight. ETA: You also want to ensure that the scope rings are compatible with Picantinny rails. I have a brand-new riser that Leapers sent me and that I can't use. If you want it, IM me your address and I'll send it to you. you need some extra high rings. extra highs are typically 1.4-1.5" high. Any higher and you have no cheekweld. I just ordered a GG&G Scout Rail. It raises you whole set up by a 1/2 inch. It will also allow you to have a rear BUIS, that will fit under your scope. This is the best quality rail that you can get IMHO. 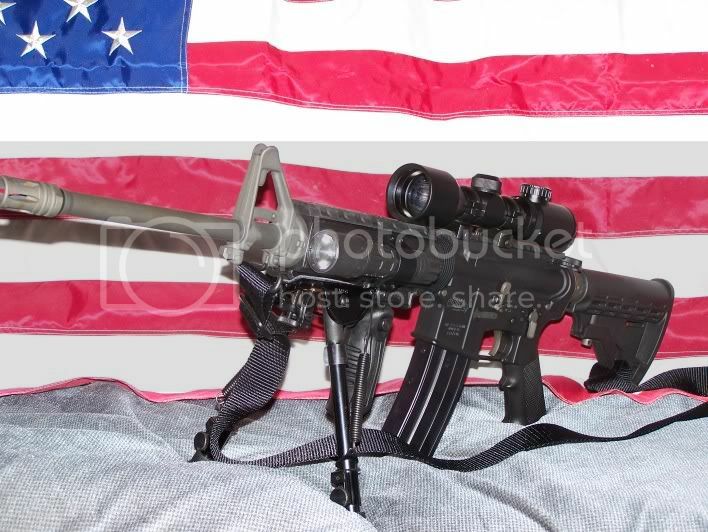 I ordered mine through www.optactical.com , they where the only ones that had them in stock at a far price. Quintico has them at a good price, but they are out of stock. This question was so urgent that you needed to post it TWICE?